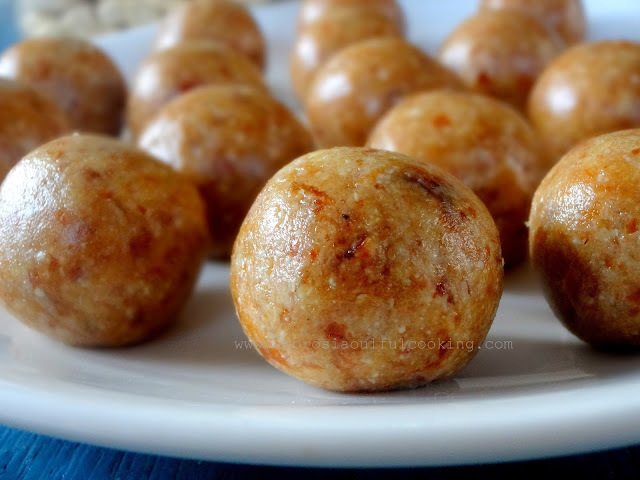 Kaju Khajoor Laddu makes a great festive sweet. It is a tradition to prepare sweets at home on Diwali and other festivals. We prepare these laddus and love them. It is a guilt-free sweet. There is no sugar in these Laddu. These are sweetened with dates. Dates are rich in several vitamins and minerals. Dates also contain calcium, iron, potassium, phosphorous, manganese, copper and magnesium. Adding dates to your sweets is a good way of incorporating them into your diet. Healthy sweets make the festivities happier. Wash dates in hot water. Remove seeds. Chop them into small pieces. Pulse cashews in the grinder to get a fine powder. To not pulse for too long. It will become buttery. Take dates in a non-stick pan or a thick bottom steel wok. Add ghee and cook dates on low flame. The dates will turn soft. Mash them with a ladle. Cook this mixture till it changes colour slightly and collects in the center as a ball. Turn off the heat and add powdered cashews. Mix well. Leave to cool for 5-6 minutes. When the mixture is warm enough to handle, make small balls. Energy balls or laddu are our latest fad. 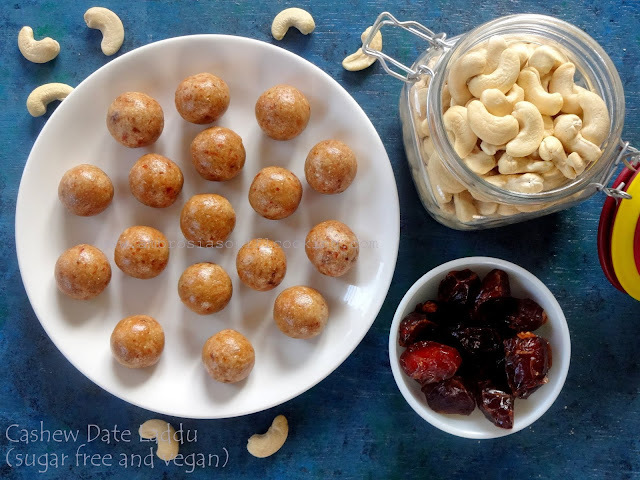 We love them in the healthy avatars – sans ghee, butter or refined sugar, It is really gratifying to satiate sweet cravings with something healthy and energy balls/laddu fit the bill. Who would not love the healthy sweets? 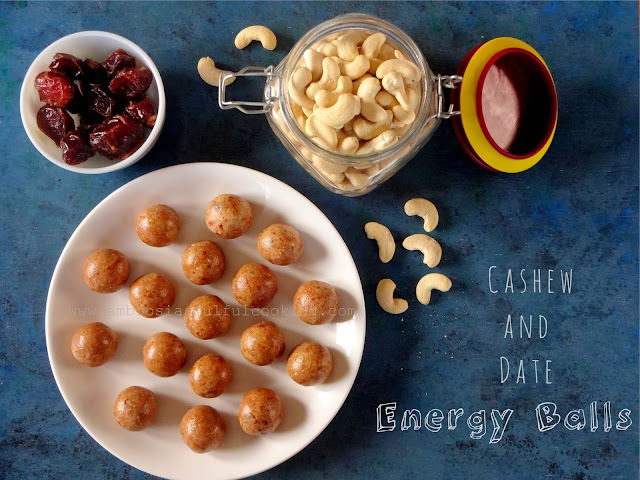 We made Cashew and date snack balls recently. Cashews are super nuts that belong to the family Anacardiaceae. This is the same family that includes Mango and Pistachios. Cashews are rich in proteins and minerals including copper, calcium, magnesium, iron, zinc, phosphorous and potassium. Cashews are also rich in Vitamin C, vitamin B1, B2, B3, and B6. Cashews are highly nutritious and should be added to the diet. 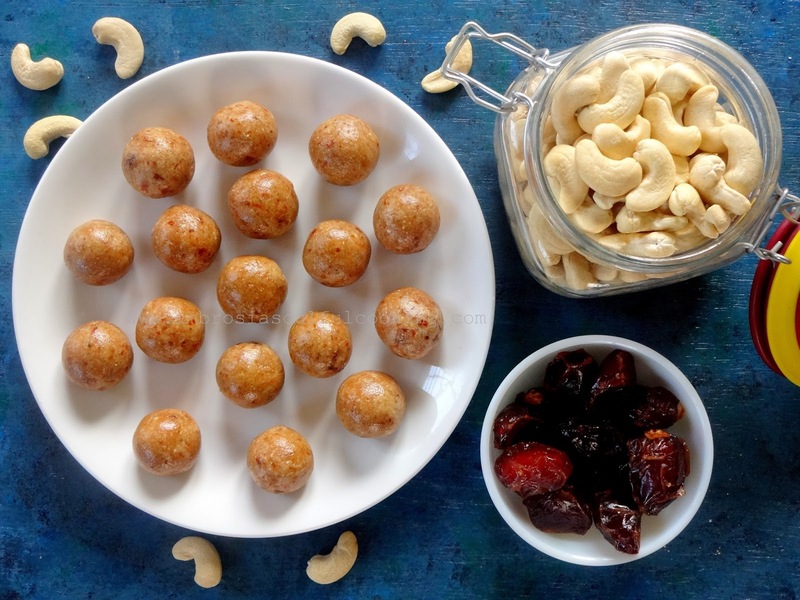 The combination of cashews and dates is heavenly and healthy. You may add half a teaspoon of cardamom powder if you wish. But plain version also tastes good. Toast cashews until fragrant and slightly golden in colour. Set aside to cool. You can also toast the cashews in your oven. Set temperature to 150 degrees C and set the timer for 10 minutes. In a thick bottom wok, toast oats till mildly fragrant. Set aside to cool. Wash dates. Chop them into small pieces. Transfer the dates to a wok. Add coconut oil. Cook on low flame. Soon the dates will begin to soften. Mash the dates with the back of the ladle. Add cashew powder. Add oats powder. Mix well. Turn off the heat. When the mixture is warm enough to handle, mix with your hands and mash to get a mixture of dough like consistency. Store cold laddu in an airtight container.